There's another new brewery to add to your list of places to visit in the C-Ville area! 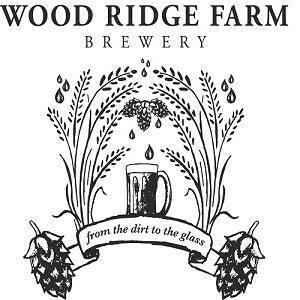 Wood Ridge is a family run farm brewery with a "from dirt to glass" motto, located in Lovingston. Their products utilize all local ingredients and they're currently growing their own barley, wheat, rye and hops. They even have their own malting facility on the property - Wood's Mill Malting. The tap room is conveniently open 7 days a week: Monday-Friday 3-8pm and Saturday-Sunday 11am-9pm. 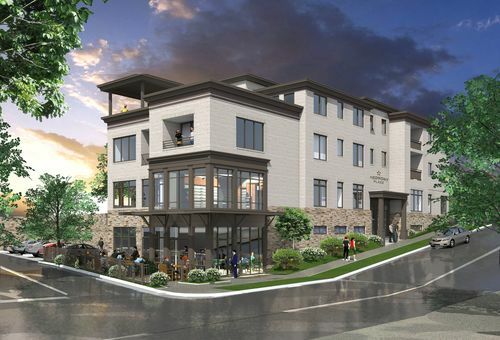 A new multi-use building, Piedmont Place, is coming to the heart of Crozet in between the Square and library! A few businesses have already opened and more are planned to open in early 2017. Included in the plans are a sky bar, wine and beer shop, coffee shop, bookstore, yoga studio and more! 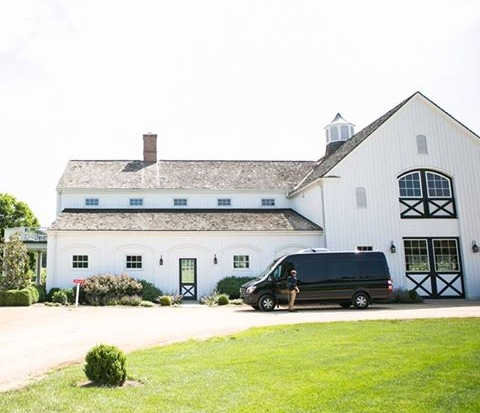 Take the driving out of your next wine tour by choosing a local wine tour company to take you safely and in style from vineyard to vineyard. For example, an average tour with Monticello Tour & Coach lasts about 5 hours and provides enough time to stop at 3-4 wineries around the Charlottesville area. Each itinerary can be fully customized based on your group size and requests. The 2016 grape harvest has come and gone, and the current vintage is ageing in barrels and tanks. The 2016 vintage had its ups and downs, just like most other vintages on the east coast. A couple of cold snaps in the spring damaged enough buds to reduce the yield of our Tannat, Chardonnay, and Merlot, but as the season progressed, the vineyard thrived and we harvested beautiful healthy ripe fruit just before the autumn rains. All of the leaves have fallen from the vines and they will remain dormant until spring. The plastic tubes that protected the young plants throughout the year have been removed, so they can harden off to better handle the cold temperatures and the soil under than plants has been hilled up around the bottoms of the trunks to provide some warming insulation. A Charlottesville-native, Cat now lives in Crozet with her boyfriend, Bob, and dog, Dixie. 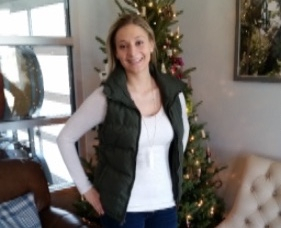 She's enjoyed working in the tasting room and finding new local wines to pair with her favorite food, spaghetti. When she's not behind the tasting bar, you'll probably find her sipping on cider at Bold Rock or bargain hunting at her favorite stores! Visit our website for a complete list of spots! 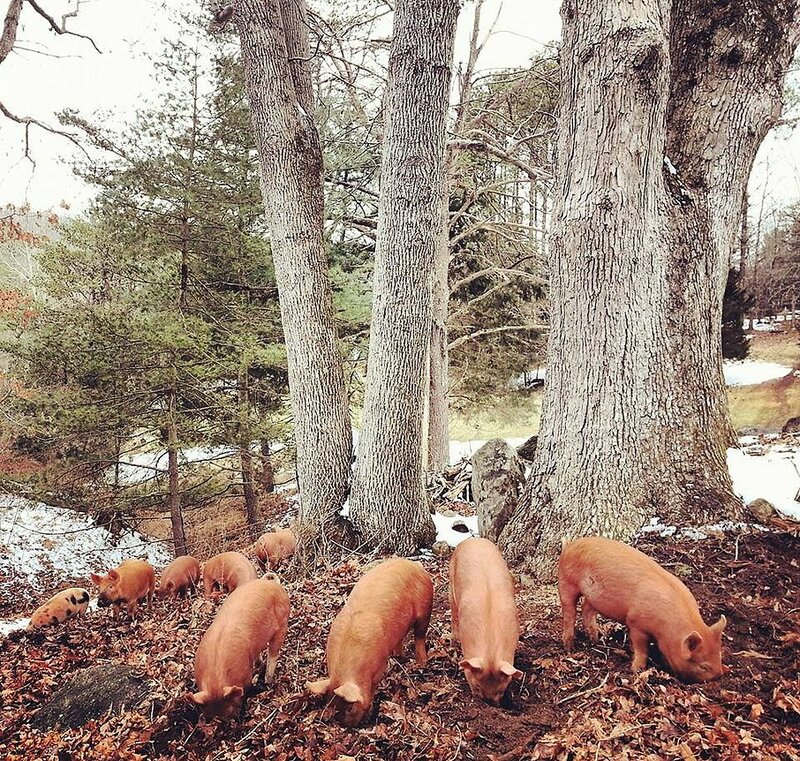 We're excited to now have forest-fed pork products from Free Union Grass Farm available in the tasting room. 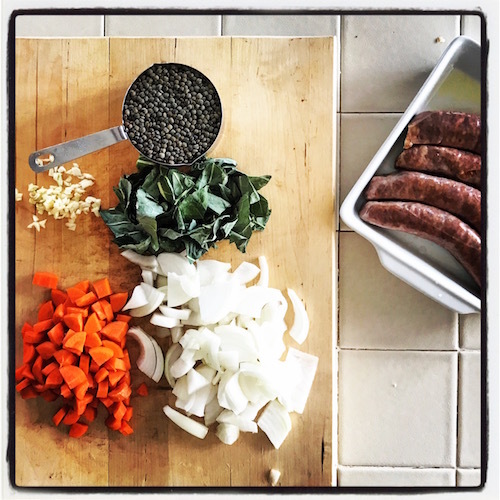 Joining FUGF's selection of chicken and beef, now we'll have pork belly, ham roast, breakfast sausage, chorizo and uncased hot Italian sausage. Our meat farm stand is open during regular tasting rooms hours (Thurs-Sun 11am-5pm). Stop by or call ahead to see what's in stock! Our heaviest Merlot blend to date exudes fresh red fruit flavors of plum, currant, and fig. Earthy tea leaf and savory black olive linger on the palate. Bright acidity and fine-grained tannins lend structure and balance. This is a wine that drinks well in its youth and will only benefit from bottle age. The 2014 Meritage is all Estate fruit and is the first blend to showcase 100% Stinson Farms fruit. 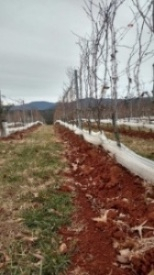 Vines are cane pruned and close spaced on the mineral rich red clay loam that is a signature of this part of Virginia. 2014 was a rare growing year in Virginia - it was neither too hot nor too cold, neither too rainy nor too dry. This coincided with our main vineyard block finally coming of age! The resulting wines effortlessly expressed a purity of fruit with the strength and clarity of young vines. 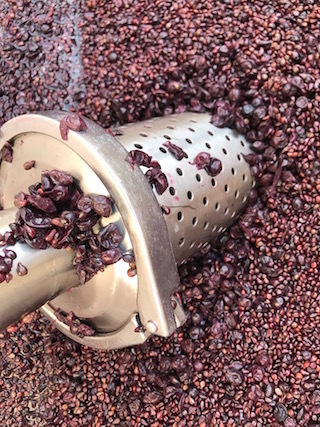 A smooth and satisfying late harvest wine. Honeyed marzipan and tangerine flavors combine with a mouth-coating sweetness. The racy acidity that this varietal is so famous for gives this depth and complexity. Two-thirds of the 2014 grapes come to us from Mount Juliet Vineyards at Grace Estate Winery, across the road from Stinson in White Hall, VA. This sweeping 50+ acre vineyard was planted in the late 90s and has been a major source of grapes for Virginia wineries. The remainder comes from our first Estate test block, planted in 2010. 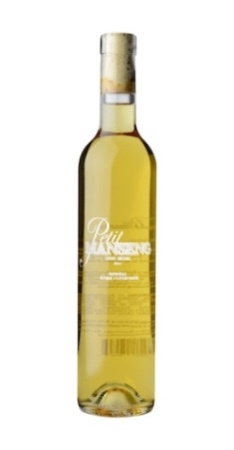 Petit Manseng makes an ideal late harvest wine - the tough skin and high acid levels of these small berries allow them to hang longer with lower disease pressure. In 2014, the Petit Manning fruit was reliable as ever and came in with good sugar and low pH. 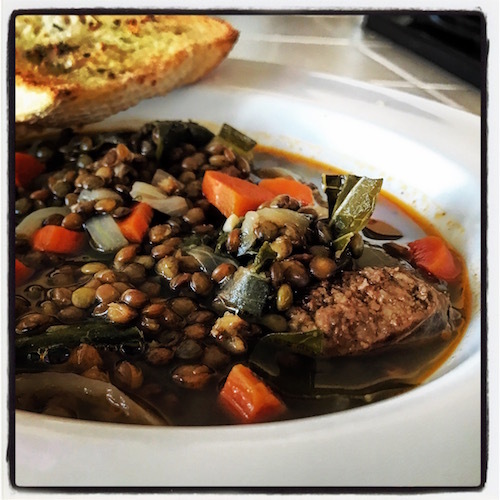 Scott has been perfecting his lentil soup recipe for years now. You'll often find him raiding the winery for food items on a cold day - if they include a pack of Free Union Grass Farm sausage and a Goodwin Creek Farm baguette, you can be sure of what he's up to. We love to pair the spicy chorizo with the sturdy tannins and refreshing red fruit of our 2014 Meritage. While this recipe makes a hearty lunch, it also works perfectly as a light dinner on those short December days! Preheat oven to 350 degrees. Place chorizo in a shallow oven dish, cutting a few small slits into sausage casings. Roast 15-20 minutes, until meat registers 165 degrees. Let cool and slice into rough half inch slices. Heat 1 tablespoon of olive oil in a Dutch oven or heavy-bottomed pot on medium-high. Add onions, carrots, and 1/4 teaspoon salt. Cook until onions are soft and translucent, about 5 minutes. Add the garlic and lentils and stir to combine. Add beef stock, water, chorizo, and collard greens. Season with 1/2 teaspoon herbes de provence and cayenne to desired spice level. Bring to a simmer, cover, and cook 30 - 45 minutes until lentils are tender. Adjust seasonings as necessary. Preheat broiler. Slice baguette and place bottom side up in oven pan. Drizzle lightly with olive oil and toast under broiler 2-3 minutes. Remove and turn over. Drizzle top side lightly with olive oil. Sprinkle with garlic powder, coarse salt, and herbes de provence. Toast another 2-3 minutes under broiler. Serve soup and baguette with Stinson Vineyards 2014 Meritage and enjoy! Copyright ©2016 Stinson Vineyards, All rights reserved.